Our route this afternoon ambles north from Glasgow, skirting the scenic banks of Loch Lomond before turning east towards our home for the night in Auchterarder. 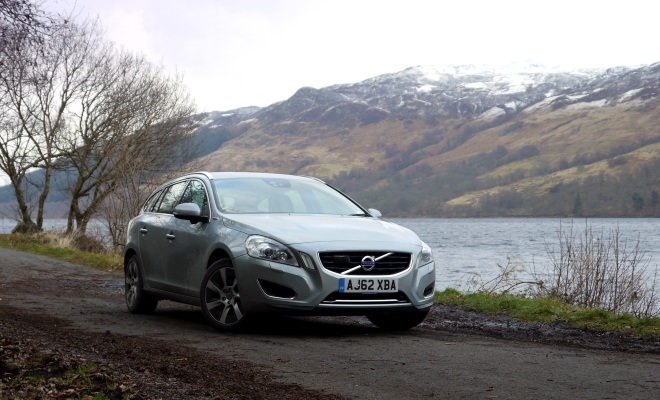 Stretching to just over 100 miles of Scottish highway, it’s the perfect way to round off a day testing Volvo’s new V60 plug-in hybrid electric vehicle, or PHEV for short. Every kind of surface lives up here – from long and sweeping bends blessed with smooth and even tarmac, to frost-bitten tracks seemingly tossed onto the rumpled land in bucketfuls of rubble. On the back-roads, our route becomes so twisted it starts to feel as if it must once have been a planner’s signature on a map, grossly misinterpreted by an overly literal road-crew. And as we close in on our hotel, the weather does the same, dusting the tight bends with a slippery coating of fresh snow. 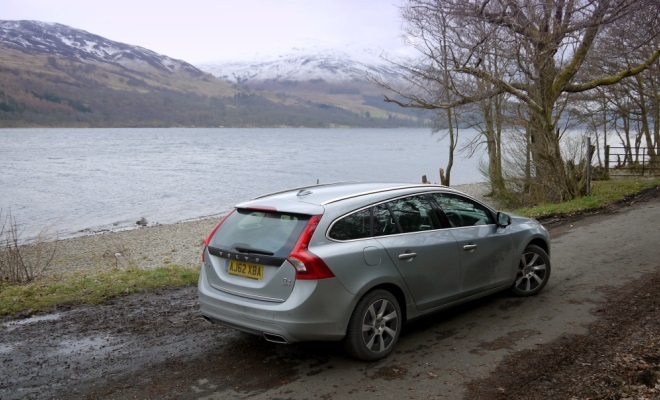 Fortunately, our V60 estate can cope with whatever the journey brings, because it has so many resources up its sleeve. Volvo calls it three cars in one, but I think it might even be four. If I prod the “Pure” button – one of a row of three just ahead of the gearstick – we travel in a silent electric city car, good for 30-odd miles between charges. The V60 will use up to 8kWh from the 11.2kWh lithium-ion battery in the boot, meting it out to a 50kW (70bhp) motor that’s capable of pushing the car (gently) all the way to 78mph. Press the “Hybrid” button and the car’s 2.4-litre, 215bhp five-cylinder diesel engine joins the electric motor, stepping in and out so quietly and smoothly I can never be quite sure if it’s running or resting. As I press on, diesel and electric power twirl seamlessly together in search of superior fuel economy. Hit the “Power” button and the tempo changes from a waltz to a tango. Throttle response becomes instant as the full potential of both motor and engine is laid out under my toe. This time, I can’t mistake the warbling five-cylinder engine’s contribution. Power pulses through the six-speed auto transmission as the revs repeatedly climb to a 4,000rpm peak, with electric power continuing to push during the smoothly slurred upshifts. All told there is 280 horsepower on offer, allowing a whip-crack run to 62mph in just 6.1 seconds. That’s noticeably faster even than proper hot-hatches like the Renaultsport Clio and Focus ST. Finally, there’s a full 4x4 mode, accessed via a separate button in among the ancillaries. With the rear axle fully electric and the front wheels diesel-powered, it proves a rather handy option in the snow, at the end of a long day, with the light fading. A generator strapped to the engine ensures the back end never runs out of juice, even if you’ve, erm, squandered all your plug-in reserves earlier, playing with Power mode. There is actually a button to preserve battery power for later, or to bring a depleted battery up to about 12-miles of electric-only range, but it’s only really needed if you want to do zero-emissions miles at the end of a long journey. The V60 PHEV’s unrivalled breadth of capability is deeply impressive, but it doesn’t arise without drawbacks. 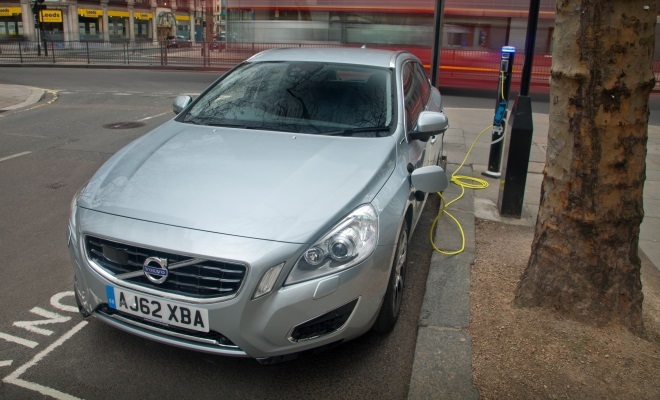 First, there’s the price, which starts from £43,775 after a £5,000 contribution from the government’s Plug-in Car Grant. While not outrageous – a Lexus GS 450h costs more – this is by no means cheap. Secondly, the battery is a big and heavy lump of technology that has shoved aside both luggage and fuel capacity. Tank volume has fallen from almost 70 litres in other V60 models to just 45, trimming range between fill-ups to no more than 560 miles. Similarly, boot volume has tumbled by 125 litres to 305 litres, or slightly less capacity than you’ll find in the much smaller V40 hatchback. On the upside, the electrified V60 can still tow 1,800kg. The liquid-cooled battery also adds 250kg to the car, bringing kerb weight to a lardy 1,955kg. 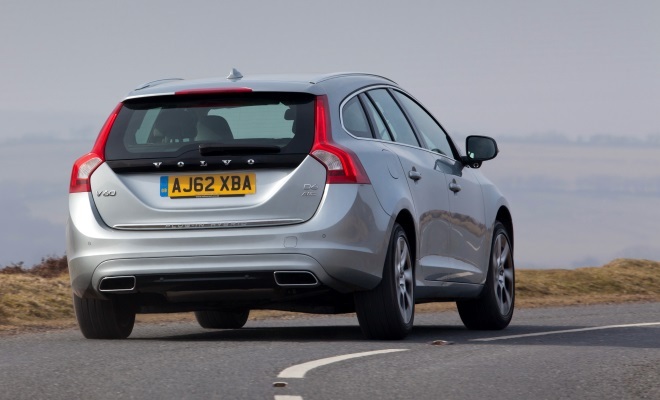 With most of the extra heft bolted directly over the rear axle, weight distribution is actually improved in the normally nose-heavy V60, with 45% of the plug-in’s total mass resting on the back wheels. While abundant power disguises the car’s heft most of the time, there is a noticeable lack of agility in bends. The V60 is never roly-poly, but neither is it truly crisp or eager to turn into bends. The brakes also feel as if they toil hard for a living, lacking the reassuring initial bite that confirms you’ll be stopping before the road merges with the hedgerow. That said, the slightly soft and numb brake pedal is probably a result of oodles of cleverness going on beneath your foot, to try to regenerate as much energy as possible while still stopping safely. With its engine-attached generator as well as its rear-mounted motor, this Volvo has two regenerative braking options to balance before we even move onto the conventional hydraulic discs. Small wonder that Volvo engineers needed to write new stability-system software to keep this car pointing in the right direction at the extremes of grip. And for those nightmarish moments when grip isn’t sufficient, there is the reassurance of Volvo’s crash-mitigation expertise, which has ensured the V60 hybrid is the safest car with a charging cable yet hurled at a wall by EuroNCAP. 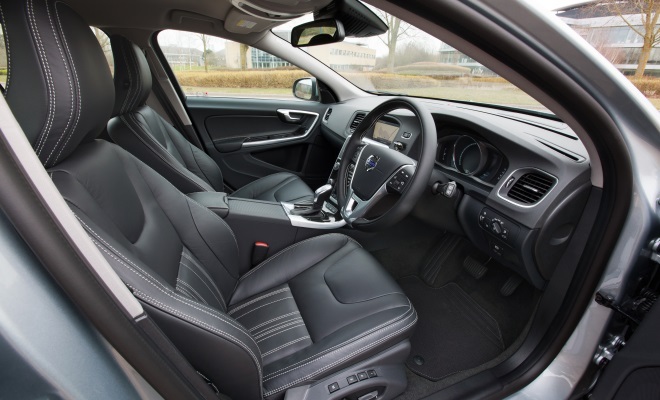 Other familiar Volvo characteristics also remain in evidence, including an airy and attractive interior built from quality ingredients, furnished with superbly supportive seats. Our test car was one of an initial batch of 1,000 limited-edition cars, all loaded with copious options and now all sadly sold. Further customers will receive a car graced with neatly revised styling for the 2014 model year, available only in Volvo’s highly specified SE Lux Nav trim. Some clever new facilities arrive along with the charging cable, which needs about 3.5 hours to recharge the battery from a domestic UK socket. A pre-heater function will let you warm or chill the cabin while the car is still plugged in, using a timer you can set through the car’s central screen or, for those less able to plan ahead, through an Apple or Android smartphone. The downloadable app, perfect for forgetful clots like myself, can also lock or unlock the car remotely, or sound the horn and flash the lights in a bewildering carpark. Fortunately, most of these features are disabled on the move – kids won’t be able to honk the horn from the back seat – although the app will tell you if the car is on the move, though sadly not where it is or where it’s going. 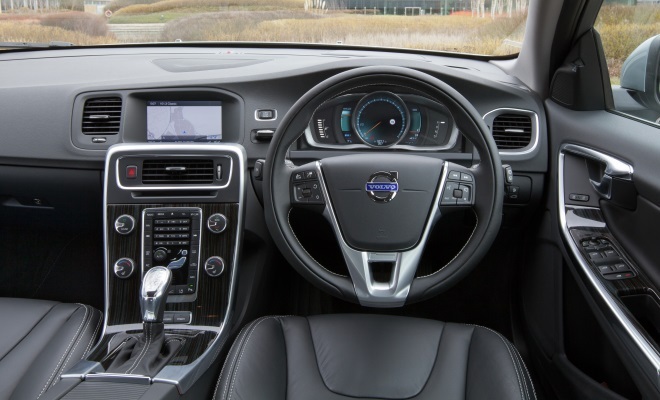 I’ve been following the development of the V60 PHEV for the past two years – after getting an early glimpse of the concept version in February 2011. I’ve taken a spin around a test track in a prototype, baked inside one in an oven, seen the covers whipped off the finished car and even witnessed the aftermath of a frightening crash test. So it felt good to finally get behind the wheel of the car on British roads, to see how well the concept had been brought to fruition. After all, the V60 PHEV promises to meld the merits of diesel cars, which excel at mile munching, with the virtues of electric cars, ideal for inner cities. I’m happy to report that the V60 PHEV doesn’t disappoint. There are drawbacks, as noted above. But for those who can afford the price, this really does feel like a small collection of satisfying cars all rolled into one.